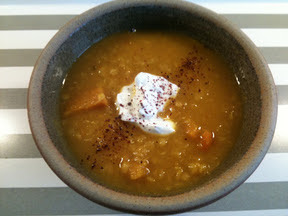 Today's recipe is a lightly spiced but still very tasty squash soup. It could also be made with pumpkin or other squash. Preheat the oven to 180C. Place the peeled, deseeded and cubes squash, garlic and carrot in a large roasting tray in a single layer (use two trays if you need to) drizzle with olive oil, spices and season and bake for about an hour or until the veg is soft and caramelised. Put the veg in a clean pan along with the stock and roughly blend so there is still some texture. Add the lentils and cook for about 20 mins until they are soft. Ladle into bowls and serve with a dollop of yoghurt and a sprinkle of sumac.